Hi Colin. Is this the Peter Jackson film - its been quite widely promoted her in NZ - what a surprise - and I would be interested to see it one day. I watched it yesterday and it was utterly captivating. Simply brilliant but sobering at the same time. I've yet to see this, but am really looking forward to it. It ais a very moving film, seeing familiar clips in colour left me speechless, the commentary by those that underwent horrific experiences was honest and "matter of fact", which surprised me. 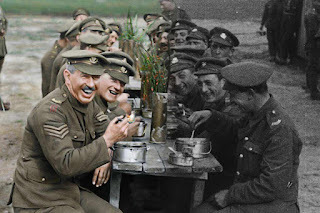 Colin, back in July I went to Wellington to see Peter Jackson's WWI display at the museum there and on display, amid the many amazing items, was an array of colourised still photos. It struck me that while this was certainly a grim time, the black and white imagery made it even more grim to our eyes. There was one image of a unit of NZ Maori pioneers in particular that caught my attention. In B&W it was grim and formal, but when colourised you could see a bunch of blokes just being a bunch of blokes, with life and humour in their faces and you could imagine the banter that would have existed amongst them and with the photographer. It drove home that although this was a dreadful Hell for all, for many - away from home and in foreign lands for the first time in their lives - it must also have been and astonishing adventure. I must be in a minority but I thought it pretty ordinary really. But, each to their own.